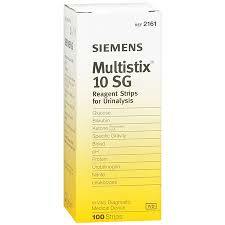 Siemens Diagnostics Multistix 10 SG Reagent Strips, CLIA Waived, 100/btl. The Multistix 10 SG reagent strip is the reliable frontline test for detection of a broad range of conditions, from detecting urinary tract infections (UTI1) to diabetes and kidney disorders. Accurately gain a broader clinical insight into a patient's health. 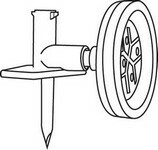 Reliable testing for UTI, diabetes, and kidney disorders. 10 tests for important markers on a single strip. Combined leukocyte/nitrite results for better prediction of UTI with fewer false negatives.